Although they say these will work on resident browns, ( which I will try ) I cant wait to see a large bass attack one of these. 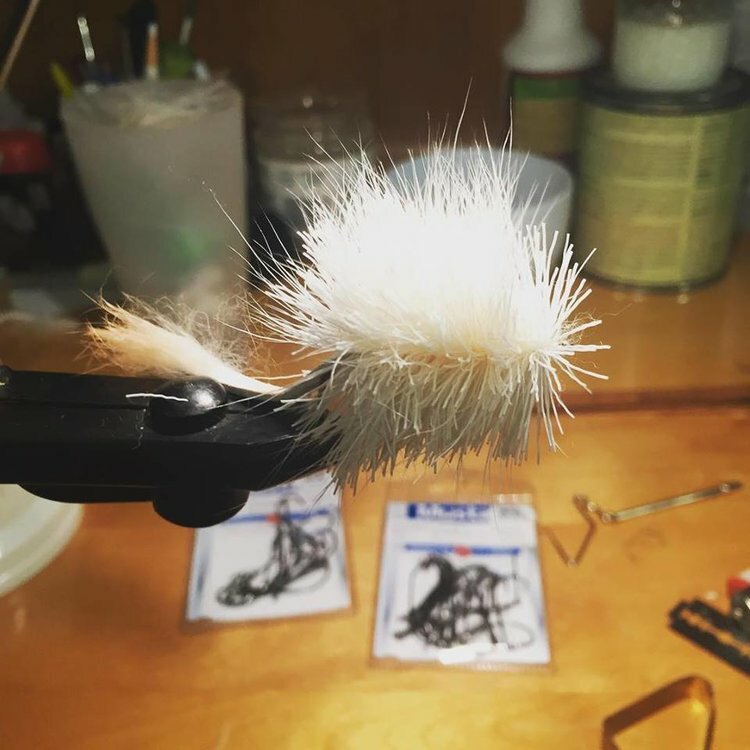 They are so easy and quick to tie. I will be making a few larger ones. These are made on #6. Just imagining that moment when you see a dark shadow slowly float up under one to check it out. A little twitch and BOOM! Thanks Tom. Im not sure how they will throw. How much water does rabbit hair absorb ? 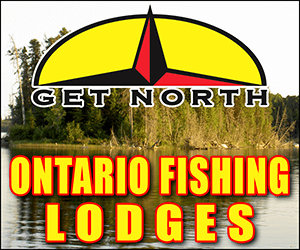 Will test them when ever we get some open water here. I do not want to do trial and error ,once the season gets here. I am thinking a 10lb leader ? Your thoughts? I may opt to use chennel (sp? )for the tail on the larger ones I will make. 1. Finer hair absorbs more water than coarse hair. 2. 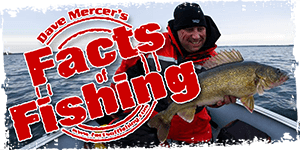 The fur from land-dwelling animals tends to hold more water than water-dwelling animals. Rabbits have fine fur and live on land, so it will absorb a good bit of water. Plan on an 8 or 9 wt rod to compensate for that. 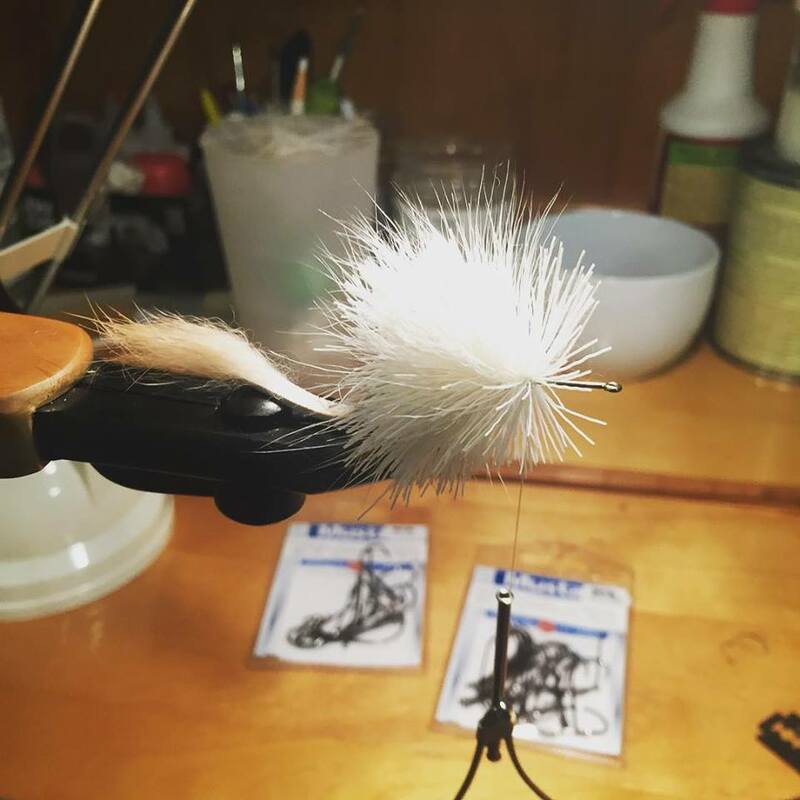 As far as leaders, you probably want shorter and stiffer to help turn over a heavy fly. Too soft of a leader will collapse on you before the fly makes it to the end. I like RIO's bass leaders. good thing to work on on a day like this! I just saw Carribean parade and if you needed feathers, this was the place! And what was wearing the feathers well not fishing material. did you get the ice storm? It came and went, so far. Do you have pic of the feather carriers ? Yes on my camera, they were very long and colourful and could really move. I complimented her on her headdress and she put it on me! I was thinking Brian could tight this for sure. I found some #4 side hooks that I had laying around. They will work fine Im sure. They are a bit tricky to tie the material on. Need to keep the bobbin tight to the shaft when wrapping and boy are those hooks lazer sharp. Goofy frog. The shank is wrapped in foam. I dont get there and the double hooks are for the bass. cant hate on smallies on the fly...even the little guys are a riot. FYI, I believe that that in the eyes of the ministry that would still be a single hook since it is of a one piece construction. Similar to how a treble is considered a single hook. Barbless, well I fly fish barbless anyhow, makes it easier to remove flies from yourself. I just finished up a 7wt that I’m looking forward to putting to use this summer for smallies. Care to share your set up for building ? I know it,s much to ask, but I would really like to see it. Nice ties - used something very similar for rainbows in Alaska, should work at dusk for big browns too! Yes, I noticed I missed that part in the video. They have since been trimmed. Thanks cuzza. Basically what you see is what you get, nothing to special. I started out on a 60" drafting table, but found the depth of the table a hindrance. Changed now to a 48" long desk, with drawers and a bookshelf for storage. Much better. Good lamp so I can see what I'm doing and all tools within reach. My wrapper is actually still the cardboard one I initially purchased from Mudhole, keep meaning to upgrade it but haven't gotten around to that yet. Thread tension is done via fly tying bobbin, I'll have one set up with my primary thread colour and a second bobbin set up with my tipping colour. 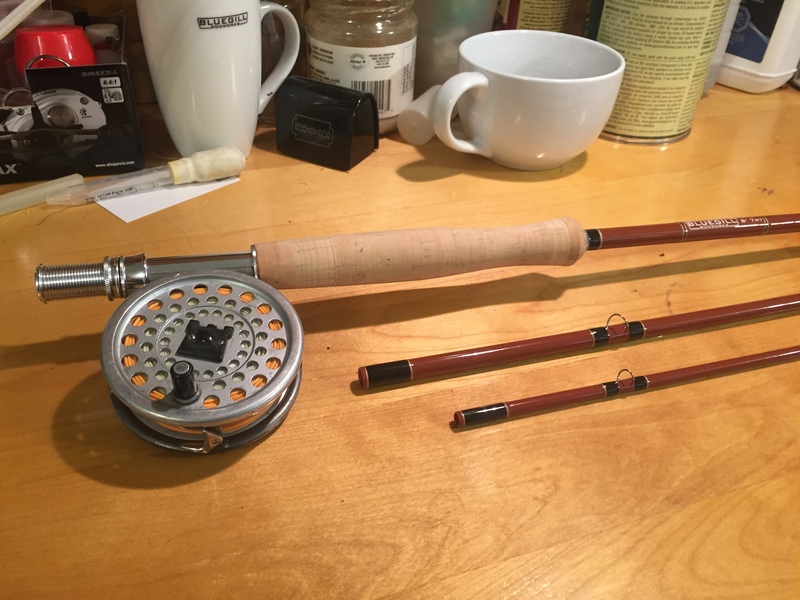 CRB rod dryer with an upgraded Fuji chuck (well worth the money). My next step will be to set up a dedicated area with a lathe for doing cork work, getting tired of buying pre-made grips and having to super clean everything when done. 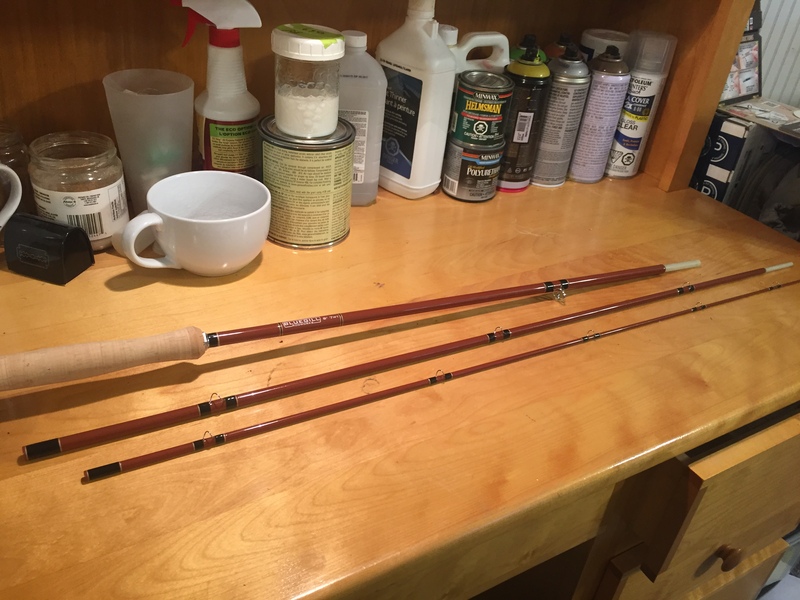 You don't need a $400 wrapper and all kinds of tools to build a nice rod. 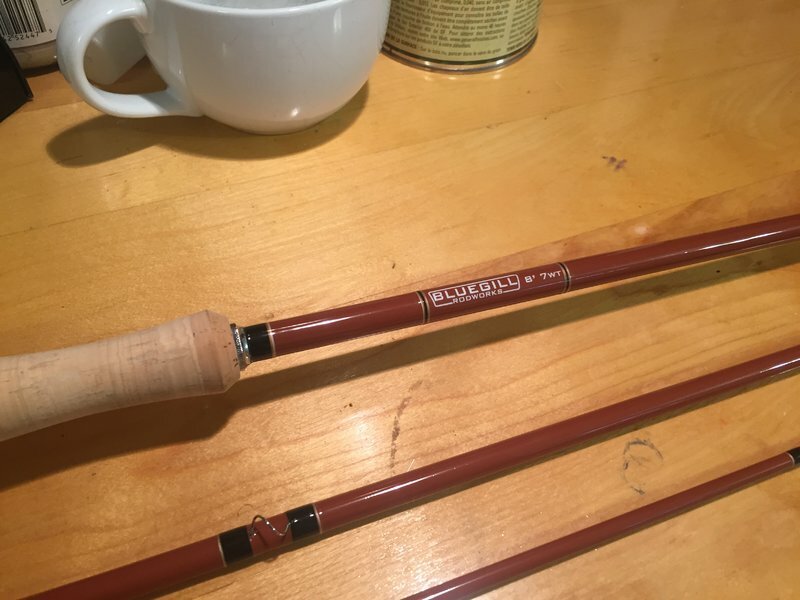 I've seen some really nice rods come off of cardboard box rod dryers, and some of the best builders of fly rods don't even use wrappers, they wrap freehand. What you need is the patience and dedication to do it and redo it until you have it right. 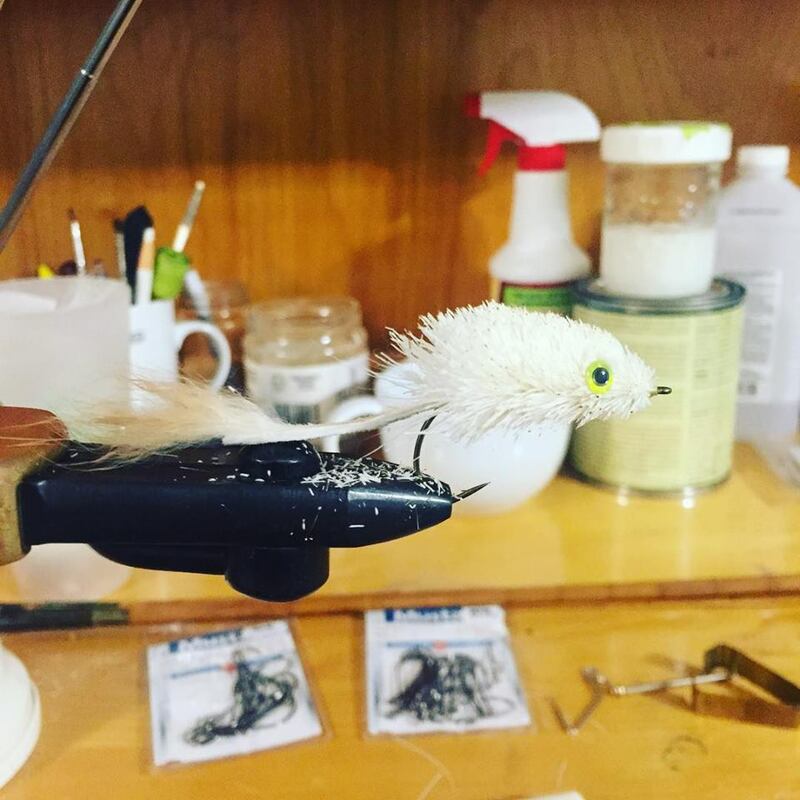 Brian, you inspired me to break out my vise tonight and tie up a mouse. I'm calling it the lab rat, even though it looks more like a gerbil with that poofy tail. I need to buy a couple of new bobbins. My thread keeps fraying and breaking. Ya I cheaped out on them. Time to pay and get quality. Been using that Canard for hackle. That is some sweet feathers. Loved it. I cant wait, but wait I must.